It’s said that dogs are like their owners… or visa-versa. If someone who is an active outdoor person, their dog will likely love to hike or play in the outdoors too. If someone gets a dog that has a log of energy and is always asking to go for a walk, the owner may start being active in the outdoors to make their dog happy. The problem with those of us who are avid outdoors people is that we usually have all the gear and gadgets we need for the sport of our choice. That makes buying a gift for us hard. So what are you supposed to get the adventurous guy or gal that has everything? Well, I put some gift ideas together for you. The items below are the coolest things I discovered and, in most cases, became an owner of, this past year. Disclosure: Some of the links below are affiliate links, which means that if you click on a product link, that I get a few extra pennies if you buy something (at no extra cost to you) to help support this blog. As always, I only recommend products I trust! In legalease… I am a participant in the Amazon Services LLC Associates Program, an affiliate advertising program designed to provide a means for sites to earn advertising fees by advertising and linking to Amazon.com. Subscription box services have exploded over the last few years. You can get subscription dog goodie boxes, makeup delivered monthly to your door, monthly snack boxes, and much, much more. The Cairn Box is the coolest thing I’ve seen though. 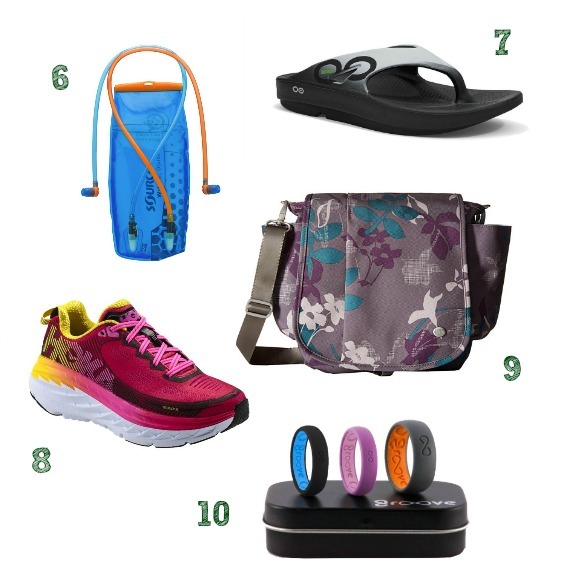 I’m a gear junkie so I like seeing and trying the latest outdoor gadgets. To me it’s totally worth it! Cairn discovers the coolest stuff and sends a box of it to you once a month. I’ve been subscribed for well over a year and look forward to its arrival every month. You can purchase your friend either a one-time outdoor goody box or a subscription. This portable battery pack has the power you need to keep those small devices, cameras, and tablets charged no matter where you are or what elements you may be out battling. It’s rugged enough to survive small drops, weatherproof, can power phones 2-3 times, a GoPro or digital camera 3-5 times, a tablet once, and more. It can be charged via a USB before you leave home or by hooking it up to one of the Goal Zero solar panels (which is super handy if you are hiking for multiple days). This cool gadget actually came in my Cairn Box (listed above) last year and I put it in my Husband’s stocking for Christmas. He likes building fires so he loves this thing. It makes it super easy to blast air into the fire right where you need it without the danger of losing your eyebrows. 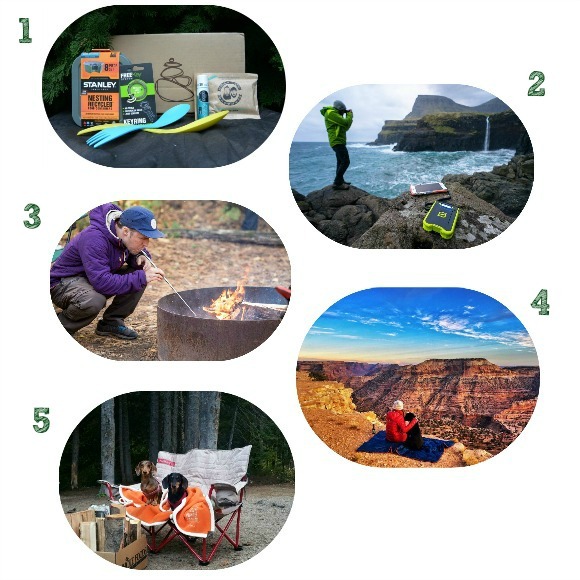 Check out the great review on GearJunkie.com (and special thanks to them for letting me use their photo). This outdoor blanket is like a thin sleeping bag with no zipper. It’s great for taking on a hike with you to sit on or wrap up in when you take a break. It also makes a good camping or travel blanket. I have a throw size for myself and my little dogs each have a Rumpl baby blanket. This folding love seat is perfect for snuggling around the campfire with your hunny and dogs. Or, in my case, just with my pups. Or, well, ok… maybe it’s just for my pups (hunny and I have to sit in our own chairs)… because, who doesn’t bring their dog’s their own camp chair?? Ha, ha. This one is perfect for Dachshunds too. It’s lower than most camp chairs so there is less impact on their back when they jump out. This hydration bladder is unique because you can put two different drinks in it. You can put plain water in one compartment and your sports electrolyte drink (or Tequila??) in the other. It has to straws so you can drink out of either compartment on the fly. The wall that separates the compartments is flexible so you can split the capacity according to your needs. Both of the compartments add up to the full capacity of the bladder (2L or 3L depending on your choice of D|vide size). These are the best sandals to slip into after a long hike. I slip them on for the drive from the trailhead back home so my feet can breathe a sigh of relief. I have even used them while driving on long road trips, when I’m flying, or after a long day walking a trade show floor. They come in both Women’s and Men’s and come in a variety of styles and colors. The Hoka One One’s Ora Recovery Slide is a good option if you don’t like a strap in between your toes. I used to be a runner but had to swear off of it to save my knees and back. I was depressed about it though. After discovering the HOKA ONE ONE (pronounced “ownie-ownie”), “maximalist” super-cushioned running shoes, I’ve been able to do some light running again. Hallelujah! The shoes have only a slight heel-to-toe drop, come in a variety of styles (I’ve tried 3 different ones but the Bondi is my favorite) and colors, and come in both men’s and women’s models. I found this bag a year ago and it’s my favorite “Dog Mom Purse” I’ve ever owned. The name says “convertible” because the straps can be reconfigured to turn it into a small backpack. It has a lot of pockets – 5 on the outside and 2 on the inside – and is big enough to carry a small camera, a notebook, dog treats, a collapsible dog water bowl, poop bags, my cell phone, a water bottle, plus a little more. It doesn’t look like a big messenger bag though. I happily use it as my everyday purse too. After two years of daily use, it’s barely showed any wear and tear. These rings are made from 80 durometer medical grade silicone. Groove Life silicone is resistant to most common chemicals including gasoline, oil, diesel, & household cleaning products. It’s also non porous, non conductive, heat-resistant, and hypoallergenic. Groove Life is the only silicone ring on the market to offer breathability (because of the grooves on the inside). They can be worn for fun or in place of wedding rings you are afraid of losing them or scratching up on adventures. The rings come in two widths, and a variety of colors, for men or women. You can’t go wrong with almost anything on this list. They are pretty unique items so it’s not common for people to already have these in their gear stash. Even if they do, they would probably welcome a second one.